At Columbia Journalism School, Danny Spriggs shares tips for young reporters working in hostile situations as Donna DeCesare, Yamiche Alcindor and Bruce Shapiro look on. What do 9/11 and Hurricane Katrina have in common? Neither was covered by conflict or environmental reporters, but instead by journalists on other beats, according to Bruce Shapiro, executive director of the Dart Center. On 9/11, journalists who were in town for New York City’s Fashion Week rushed down to ground zero to cover the attacks; in New Orleans, it was the art critic, sports editor and food writer that stayed behind to report for The Times-Picayune’s “bureau in exile” after the levees broke. Last week, the Dart Center sponsored a panel at Columbia University’s Graduate School of Journalism to highlight some of the ways reporters can keep themselves safe in the face of all kinds of volatile situations. Shapiro, who moderated the panel, framed the conversation with a number of factors that he believes must be part of every reporter’s toolkit: assessing physical risks and security, understanding legal rights, and establishing a baseline for psychological safety, peer support and trauma awareness. Shapiro introduced the powerhouse panel comprised of USA Today breaking news reporter Yamiche Alcindor, documentary photographer Donna De Cesare and AP’s vice president of global security and the former number two of the Secret Service Danny Spriggs, who each presented on the topics under discussion before sitting down for a conversation together. 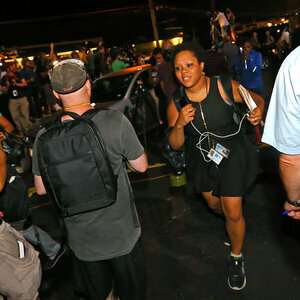 Yamiche Alcindor, best known for her coverage of protests in Ferguson and Baltimore, is national breaking news reporter for USA Today based in New York City. Don’t embed in a crime scene if you have no idea what you’re doing. Covering crime doesn’t mean you have to be in the line of fire – be smart and strategic, and know your limits depending on your level of experience. Make sure you’re clothed and fed so you can be mobile and physically safe to tell the stories you want to tell. “I’m a completely different reporter when I’m hungry,” said Alcindor, so pack snacks and water. Bring cold medication or any medication you think you might need. Invest in a solar powered pack and a portable charging device for your phone. Know yourself and what you bring to a story. “I humanize myself,” said Alcindor. Self-defined as a friendly, short, African-American woman, Alcindor uses her characteristics to put people at ease and to be relatable. Whether you’re approaching people combing through convenience stores in the thick of chaos in Ferguson or the CEO of T-Mobile, use your life experience and treat people with humanity, she says, regardless of who they are. Know your biases and be honest about them so you can be fair to all sides – others will feel safer and more considered by you. Listen to colleagues and mentors. If they tell you not to do something, just don’t do it. Be kind and human to every person. “I really don’t want to go to jail,” said Alcindor. She says she is one of the few reporters in Ferguson to have avoided arrest, being roughed up or having things stolen. Alcindor believes this wasn’t just luck – she was nice to cops, looters, protestors, and most importantly, other reporters. Click here for more tips from Yamiche Alcindor. Donna DeCesare has worked as a documentary photographer for more than thirty years focusing on civil conflict, natural disaster, and gang members and their families throughout Latin America and the United States. She teaches journalism at the University of Texas, Austin. Be mindful and focused. Photojournalism is an embedded form of reporting and requires the photographer to get close both physically and emotionally. “Your relationship to people and being human with people, letting them be curious about who you are as well – that keeps you safe,” said De Cesare, because you’ll build relationships and people will look out for you. Bring the right equipment. If you’re covering a protest, what do you need to have if you’re hit with pepper spray or tear gas? If you’re travelling, what will help you stay mobile? Don’t throw everything you have in a suitcase. Instead, pack like you’re going on a long hike or camping trip. Consider a light bag that’s organized with food, paper copies of maps, water, chargers and your devices. Carry a Swiss army knife and a cash belt (ATMs don’t exist everywhere). “Don’t go in looking like a walking camera store.” Depending on the situation, you may not want to flash your camera gear, wear a photographer’s vest or display press credentials. You’ll need time to introduce yourself and build a relationship with sources. If you’re in a protest, though, the opposite may be true. You’ll want the police to be able to identify you as a journalist. Always complete a risk assessment and talk to local reporters. No matter where you’re going, whether you’ve been there or not, the people who live and work there know what’s going on best and can help you assess the current climate. If the police become confrontational, know your rights. Consult the ACLU’s guide for photographers. Be calm, diffuse the situation and be as friendly as possible with everyone. Consider the health and environmental risks. Prepare yourself for local illnesses and health risks. Before De Cesare traveled to Peru, she learned that many children had tested for high levels of lead. To protect herself, she had her blood tested before and after travelling to assess her own effect to lead exposure, and make sure it was safe for her to return and continue reporting. Buy Traveler’s Insurance. It’s just worth it. Have communication and safety protocols. Develop contingency plans in case of emergency and have contacts on the ground you can trust and who will help you. Keep in regular communication with someone who knows where you are as a safety precaution. Sometimes the only person you can stay in regular contact with is a local guide or fixer. Meet in public. When you meet a subject for the first time, don’t meet that person in a secluded place. If you develop a relationship and begin to trust them, you can move elsewhere. If you become fearful, try to breathe deeply to maintain a sense of calm and then leave. Ethical safety. Research ahead of time and consider the safety of your team and your sources, especially young people and vulnerable individuals. Danny Spriggs is vice president of global security at the Associated Press. He spent decades in the Secret Service, and served under Ronald Reagan during the assassination attempt on the then-President’s life. Planning, proper response and having the necessary contingency plan. This is how the Secret Service saved President Reagan’s life and is what will save a reporter’s life in a risky environment. Use proactive as opposed to reactive measures. When you are heading into a risky situation, consider whether it’s best to avoid the situation, or what you can do to ensure maximum security. Do a journalism risk assessment. “I get it when journalists come to me and say they need to be there, that there is a competitive edge of being there, of being first and being accurate,” said Spriggs, “but be smart about it.” AP now requires reporters to cover safety and security issues when pitching stories. What is the story? What do you plan to gain as a result of this story or assignment? Is there an overall coordinator? What is the risk – is it natural disaster, war, infection? Go through hostile environment or first aid training and get protective gear. Always have an exit plan. Know where to retreat to if something goes wrong, where the nearest medical facility is and how you can get there.